In large bowl, combine all base ingredients except flour; blend well. Lightly spoon flour into measuring cup; level off. Add flour; mix well. If necessary, cover dough with plastic wrap; refrigerate 1 hour for easier handling. Heat oven to 325°F. On well-floured surface, roll out half of dough at a time into 10x8-inch rectangle. With pastry wheel or knife, cut into 2-inch squares. Place 1/2 inch apart on ungreased cookie sheets. In medium saucepan, combine caramels, 3 tablespoons whipping cream and 3 tablespoons margarine; cook over low heat, stirring frequently, until caramels are melted and mixture is smooth. Remove from heat. Stir in 3/4 cup powdered sugar and chopped pecans. (Add additional whipping cream a few drops at a time, if needed for desired spreading consistency.) Spread 1 teaspoon warm filling on each cookie square. In small saucepan, combine chocolate chips, 1 tablespoon whipping cream and 2 teaspoons margarine. Cook over low heat, stirring frequently, until chocolate chips are melted and mixture is smooth. REMOVE FROM HEAT. Stir in 3 tablespoons powdered sugar and 1 teaspoon vanilla. 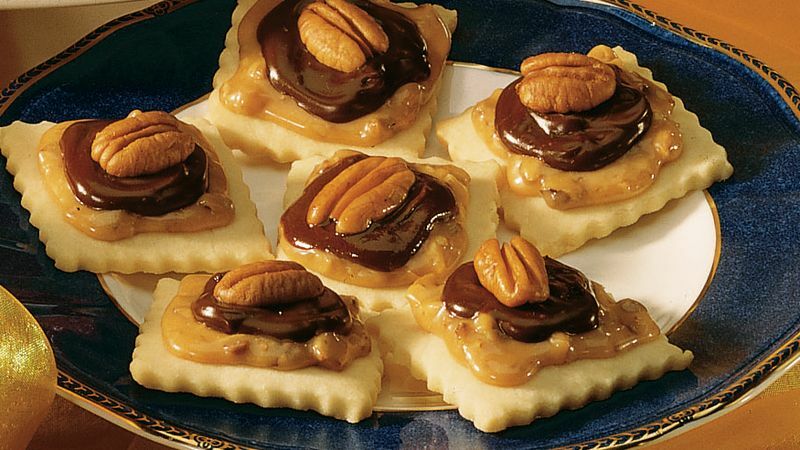 Spread glaze evenly over caramel filling on each cookie. Top each with pecan half.